We all know that staying healthy is a primary concern in every family. We eat a balanced diet, get enough rest, exercise, take vitamins supplements and have regular wellness check ups with doctors and dentists. We keep our homes clean and teach our kids proper hygiene. When I was a kid, I often heard my mom say, "Don't put that in your mouth! Its dirty!" Now, as an adult, I realized that I have overlooked one "dirty" thing that I stick in my mouth everyday. That thing that is supposed to keep my teeth and gums clean may actually even be the reason for me to get sick. Did you know that toothbrushes can be a breeding ground for bacteria and viruses? Yes they do, and we must seriously consider keeping them clean. My sister and her husband are both dentists, so I know a thing or two about oral and dental health. They recommend that we (1) replace our toothbrushes every two to three months or when the bristles start to get frayed; (2) rinse them out thoroughly in tap water after every use; (3) shake out excess water and store in upright toothbrush holders; (4) clean toothbrushes by soaking them in antibacterial mouthwash. I follow all these and yet, I still feel vulnerable and fearful of those unseen creatures that may be thriving in my toothbrush. 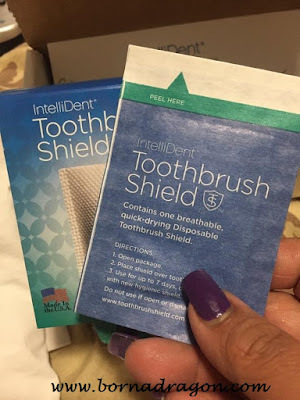 Fortunately, I was offered to do a review for IntelliDent® Toothbrush Shield. It is an amazing product that ensures a 99.9% barrier protection against surface and airborne bacteria! The package contains 10 disposable shields, each individually wrapped in cold seal wrapper. 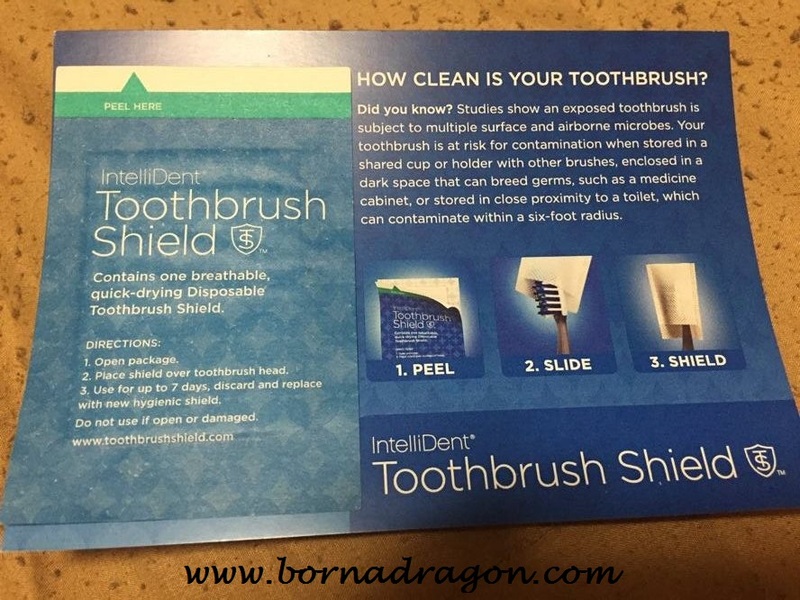 Each breathable, quick drying shield can be used up to 7 days, acting like a surgical mask to protect your toothbrush. 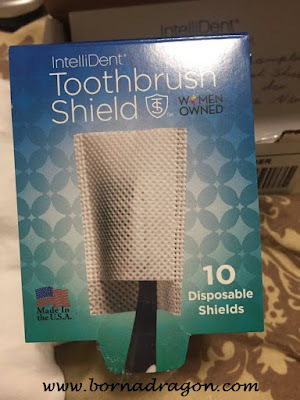 This toothbrush shield is so easy to use. 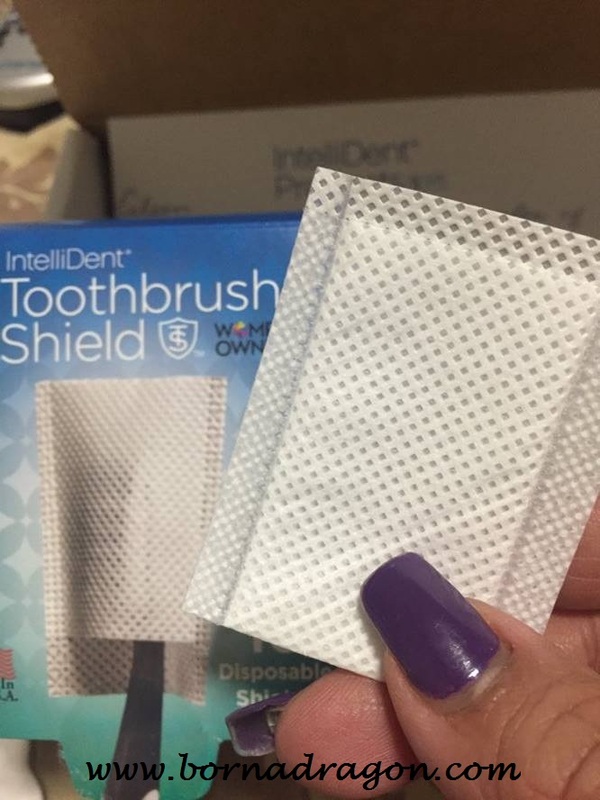 Simply peel open a pack, slide the shield over your toothbrush and you're done! Your toothbrush is now safely covered and protected from bacteria and viruses! 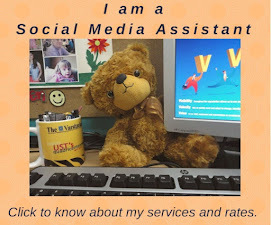 This is the second day I have used it and I would say I am very impressed! 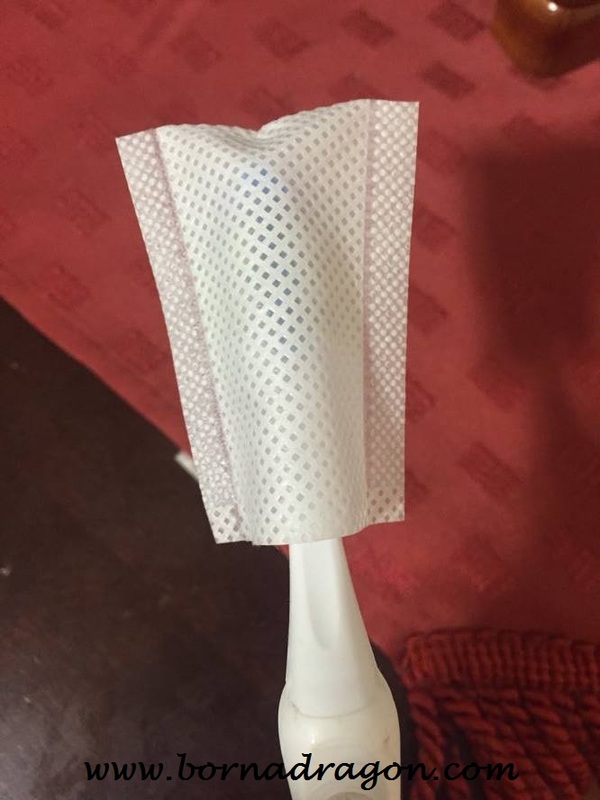 Because it is made of breathable material, it allows my toothbrush to dry completely after every use thereby preventing bacterial growth. I can rest assured that I won't get any toilet "mist" in my toothbrush too! I gave my sister and her husband one shield each for them to try and recommend to their patients. I strongly suggest you try them out too! Remember, as cliche as it may sound, "Health is Wealth." I can now do away with plastic toothbrush caps and holders that trap moisture! My toothbrush is no longer a breeding ground for bacteria. I now keep it protected whether I am home or out traveling! My children can also keep their toothbrushes bacteria free when they travel to places doing thesis research. The other great feature I love is that each sleeve provides protection for up to 7 days! IntelliDent®'s Toothbrush Shields are 100% made in the USA and available in Walmart stores around the country. You can also purchase them online through Drugstore.com, Walmart.com, Walgreens.com, Riteaid.com. Disclosure: This is a sponsored post IntelliDent® Toothbrush Shield. I have been compensated and received the samples for free in exchange for an honest review.